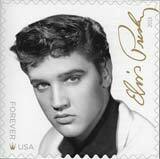 Elvis Aaron Presley was an American singer, musician, and actor. One of the most significant cultural icons of the 20th century, he is often referred to as "the King of Rock and Roll", or simply, "the King". He met Prisilla when he was in the army. He had a twin brother, named Jesse Garon Presley, who was stillborn. "I wouldn't call girls a hobby. It's a pastime." "I don't like to be called Elvis the Pelvis. It's one of the most childish expressions I've ever heard coming from an adult. But if they wanna call me that, there's nothin' I can do about it, so I just have to accept it." "When I started singing, I weighed 153 pounds. I weigh 184 now. I haven't gotten any taller, but I'm putting on a little more weight." "I like pork chops and country ham, creamed potatoes, stuff like that. Redeye gravy. It comes from ham, bacon, stuff like that. It's the grease that you fry it in. I eat a lot of Jell-O. Fruit Jell-O." "In public, I like real conservative clothes, something that's not too flashy. But onstage, I like 'em as flashy as you can get 'em." "The only exercise I get is on the stage. If I didn't get that, I'd get a little round around the tummy, as much as I eat." "The only kind of trouble I've ever been in is when I was stealing eggs when I was little. I think I know right from wrong." "The first car I bought was the most beautiful car I've ever seen. It was secondhand, but I parked it outside of my hotel the day I got it. I sat up all night, just lookin' at it." "The thing I like about success is to know that you've got so many friends. A lot of real close friends that I've made since I've been in the business." "I've had a pretty good lesson in human nature. It's more important to try to surround yourself with people who can give you a little happiness, because you can only pass through this life once, Jack. You don't come back for an encore."